Last night I had no desire to cook. This is probably evident from the incredibly uninspired meal I threw together with leftovers. 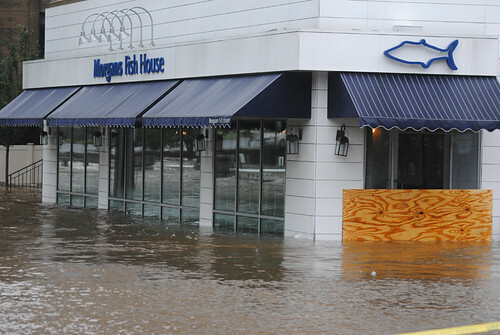 What I wanted to do was go to our local watering hole: Morgans Fish House. This is one of our favorite places to go for dinner. They have a menu that is right up our alley and usually very good service. Unfortunately after the events of last week our local watering hole had become . . .
. . . a local watering hole in the very literal sense. I found out today that after their catastrophic flood they had actually opened for business the next day. The last time we went there we, for some reason, had a tremendous amount of lobster. I had a lobster roll, Jen had a lobster dinner, and I had a Lobster Ale from Belfast Bay Brewing Company. We had so much lobster that we actually took a bunch home and I froze it right beside a lobster tail which had been in the freezer for a short time. On the menu that night was a crab corn risotto which sounded fantastic but regretfully neither of us ordered as it would have interferred with our lobster-having experience. I started off by grilling some corn on the stovetop since it's raining so hard today I'm expecting another flood. 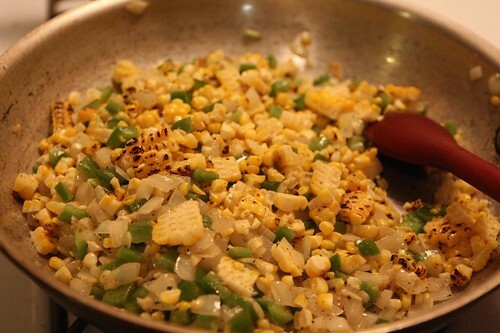 Then I sauteed up some onion, garlic, and Diabolo peppers from the farm. I normally use white wine or sherry when I make a risotto but I had an idea to use ale instead this time. I was back and forth about this idea, not sure if it would turn out okay. Then I thought of the Michael Jackson's amazing beer-themed meal in Belgium and thought about what he would do. I also thought of Jamie Oliver always talking about being brave. 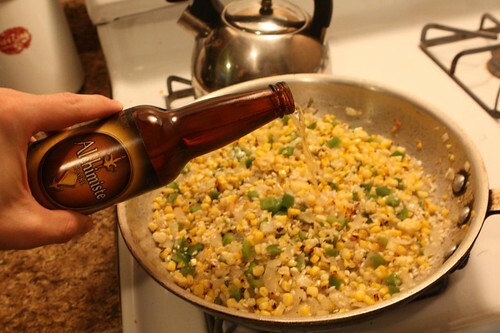 Finally, I thought of The Beer Cook who never misses an opportunity to cook with the beer. So it was, with outstanding courage, that I poured ale into the risotto while I was making it. Instincts be damned! The final result was quite nice. The ale worked better than I'd thought. 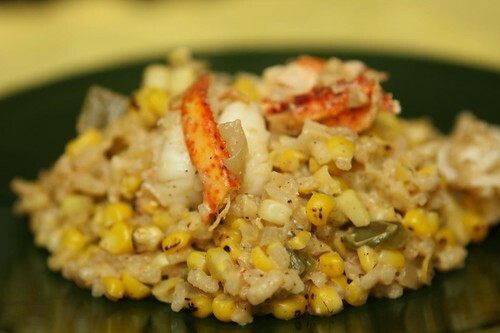 The final risotto had butter, sauteed onions, Diabolo peppers from the farm, grilled corn, garlic, arborio rice, ale, water, salt, pepper, cayenne, chili powder, and a dash of cream. Jen is pretty much the best wife. She's also the smartest. No, I'm not laying the groundwork for an expensive electronics purchase. Instead, I'm simply recognizing her genius. She just went to Montreal for the weekend. She knows that the best way to make me happy after a road trip is not to spend vast sums of money on clothing, tchotchkes, or other paraphernalia. No, all she need do is bring back an assortment of beers I've never tried before. They don't even really have to be from the place she was visiting. Any kind of beers will do. 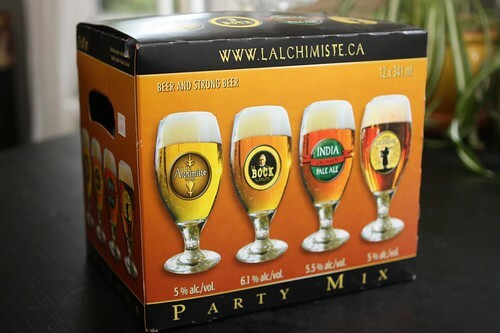 So it was that I got this party mix from L'Alchimiste in Joliette, Quebec. A microbrew so small and relatively new (founded about a decade ago) that they haven't even put up an English website. 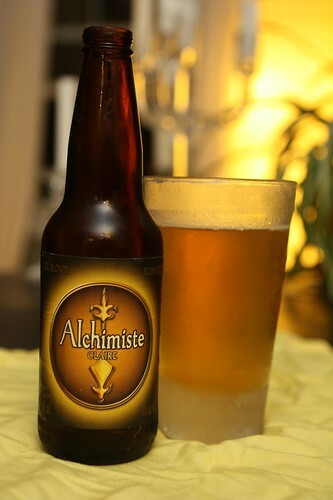 I decided to pair this meal with L'Alchimiste Claire Blonde Ale which I also used in the risotto itself. This was a very nice beer. Similar to many blondes I've had before but a little creamier which matched the risotto quite well. Of course, that's only if you buy into that beer-pairing baloney. This dinner would have probably gone just as well with an IPA, porter, or lambic. If those are beers you like. So, next time you're making a risotto don't reach for the white wine, grab a difficult to find beer that's not imported to the United States. Seriously. Don't try another ale. Only the one I mentioned in this blog entry will work. Anything else will ruin your dinner. And your life.